Unlike existing methods of assessing bone fragility, which measure bone density using X-rays, the device is designed to measure the ability of bone tissue to prevent small cracks growing into full-blown fractures. 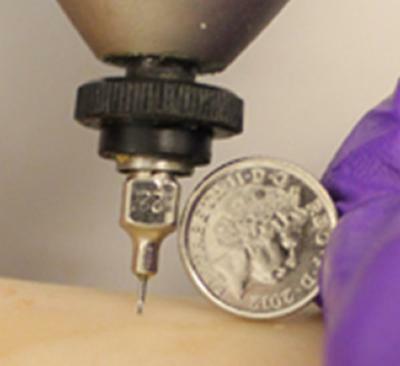 It does this by pressing a microscopic needle a tiny distance into the top layer of bone. Measured electronically, the amount of penetration indicates how fragile the bone tissue is and therefore the risk of experiencing an osteoporotic fracture later in life. Osteoporosis is often referred to as fragile bone disease. However, for many sufferers, the first indication that they have the condition is when they actually sustain a fracture. Drugs can slow or arrest the development of the disease, but the condition may already be quite advanced by the time the first break has happened. Doctors can estimate an individual’s risk of fracturing by using bone-density measurements and other factors such as age, gender, smoking and any history of fracturing. But the new microindentation technology affordably delivers a fundamentally different measurement that has huge potential to refine such an evaluation. A normal reading might see the needle sink into the bone by around 20 micrometres (0.02 mm); a reading of 40 micrometres might indicate a significant risk of fracture. “The National Osteoporosis Society welcomes new research in understanding bone health and osteoporosis, and this new study is certainly interesting,” says Claire Bowring, Medical Policy Manager at the National Osteoporosis Society. The three-year research project, Handheld Microindentation – A Direct Assessment of Bone Fracture Risk? (EP/J008192/1) is due to run until 2015 and is receiving total EPSRC funding of around £438,000. Before it can enter widespread use, the technology will require further clinical development and testing in clinical trials. The NHS now spends around £2 billion a year treating osteoporotic fractures.